doc/examples/decoding_encoding doesn't decode test.mp2 properly, i.e. the produced test.sw has incorrect contents. Build the API examples from the latest source, then run decoding_encoding with argument "mp2"
What do you mean with "incorrect contents"? I assume "test.sw" should contain raw decoded samples (16 bits, signed) of "test.mp2" (left channel only, I further assume). I opened "test.sw" in "Amadeus", an audio editor, and the signal is very distorted. Below is a link to a screen shot comparing the original audio ('test.mp2', as decoded by Amadeus) and two instances of "test.sw", made by running "decoding_encoding" twice. It appears that the decoded samples don't match the original everywhere. Also, there is some randomness in the distortion. I would expect the program to produce the same output when run several times, but it is not the case. 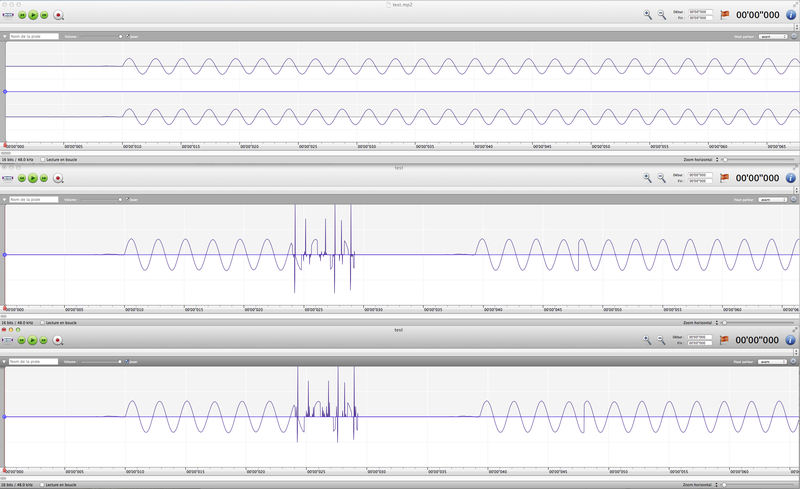 NB: the screen-shot only shows a fraction of the first second for clarity, but the signal is distorted throughout. I assume "test.sw" should contain raw decoded samples (16 bits, signed) of "test.mp2" (left channel only, I further assume). I opened "test.sw" in "Amadeus"
Why didn't you open it with FFmpeg? ==26166== Copyright (C) 2002-2013, and GNU GPL'd, by Julian Seward et al. The fix is to replace "c->channels" with "1" on line 304 of decoding_encoding.c. That's because decoded_frame->data only contains data for 1 channel, not for both. After the fix, the output (test.sw) is as expected, and valgrind doesn't mention any more memory addressing error. Also, the output is now stable, as expected. ==27570== Copyright (C) 2002-2010, and GNU GPL'd, by Julian Seward et al.